As many girls do, growing up Lauren had dreamt of meeting a “tall handsome man with a pickup truck”. Five years later that dream turned into a reality. On the 26th of May 2018, Lauren and Sean were wed at The Barn at Four Pines in Crosby, Texas. Skys the Limit Production was present for videography, capturing the beautiful moments of this love story for the couple. The Bride’s hair was carefully pinned up to perfection, her skin glowing like sweet southern honey, and her dress clung in a beautiful white silhouette. The groom wore an ashy grey suit with his hair clean cut. His smile radiated as bright as the sun. 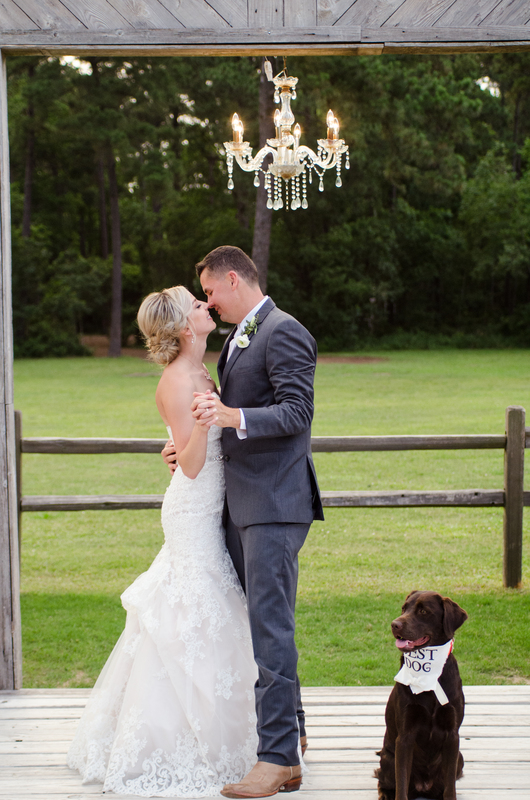 Their beautiful dog Penny was also a member of the wedding including the ceremony. After Lauren’s dad gave her away, the two exchanged their own daddy and daughter tradition and gave each other a pat on the head; telling the other that they love them. The couple wrote their own promises to one another during the ceremony. Sean revealed Lauren was a part of his bucket list, that she would be the only one he would want to ride life’s roller coaster with, and she will always be worth it. Lauren vowed to always stand by Sean’s side during the lightest and darkest of times, to take care of him when he’s down, to be faithful and respectful and most of all, to love him unconditionally. The guests cheered and clapped as the newly weds made their grand entrance into the reception hall along with their “best” dog. Toasts were made by the Maid of Honor, who let everyone know the back story of Lauren’s love interest in Sean, and the Best Man, who shared how happy Lauren made Sean and what that meant for him. Both those special people welcomed the couple as family. After the cutting of the cake, Lauren smashed the cake into Sean’s face directly following in the roar of the crowd’s laughter; he playfully paid her back. The reception was a sea of joy, during which the guests sang “Happy Birthday” to Lauren’s Grandfather. The night ended with rain, but that didn’t faze the newly weds or the guests; they embraced the good luck and watched the weather outside underneath the opened barn. Skys the Limit Production would like to thank the couple and their family and friends for allowing us to capture such a beautiful union. Congratulations Mr. & Mrs. Towey!